Sev Trek: The X Generation features Star Trek humor and cartoon satire of TNG - Star Trek: The Next Generation with caricatures of Picard, Riker, Data, Troi, Dr Crusher, Geordi La Forge, Ensign Ro, Guinan and Wesley Crusher! Includes a humor competition where you write the punchline, a weekly comic strip, Star Trek cartoon T-shirts and more! First Officer Piker’s skin complexion is on the line in this 8-part cosmetic cartoon thriller! If this is your first visit, start at Episode #1. Sev Trek: The X Generation is the longest feature on the Sev Trek web site, and consequently over time, I’ve drawn a few full page, single episodes. Warning - each cartoon is about 90k in size, but they’re worth the wait, I assure you! To Politically Correctly Go - Captain Pickhard and the Enterprize face all dangers, none more perilous than offending minority and racial groups! Technobabble - The language even the Universal Translator doesn't understand! Counsellor Tryhard - In this episode, Counsellor Tryhard tries to do something useful. Will she succeed? No, not really. 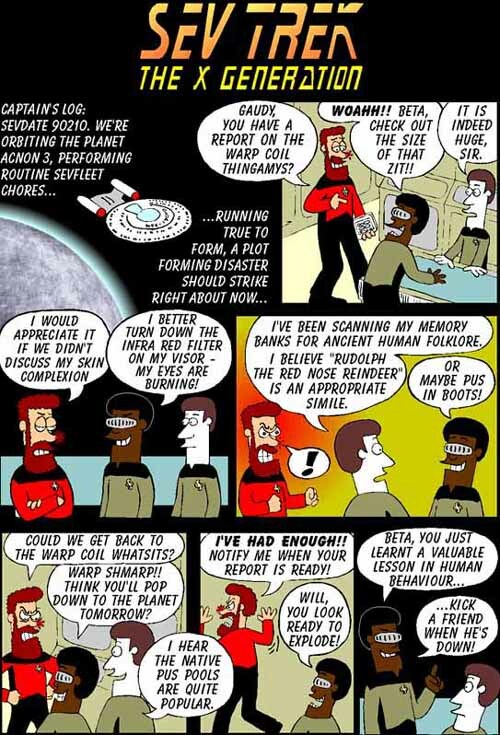 A number of the Sev Trek comic strips are based on TNG. While I recommend you go directly to the Sev Trek Comic Strip page and read them sequentially, you can pick out the TNG strips directly from here if you like. #2: Is Beta IBM compatible? #12: The state of the Alfafa Quadrant. #34: Where do they keep the toilets? #192: What use is Tryhard? Here are caricatures and descriptions of the crew of the Enterprize. All the main crew as well as many of the recurring characters can be found here.